New business models such as “pay per use” or supplementary charges for subsequently sold features are an important trend in many industries. Product costs can also be lowered by using standardized hardware, with product features increasingly being differentiated using software. Consequently, reliable software activation – and deactivation – of features becomes a central challenge as the risk of unauthorized use of such features increases. Preventing unauthorized feature use is crucial in order to protect the business models affected. ESCRYPT’s solution allows simple, yet effective control of the feature activation process. It is based on advanced cryptographic key management that interacts perfectly with a security software component on the embedded device. User requests to activate features are received by the ESCRYPT backend software over a secure data connection. A real-time authorization check is carried out before the activation is confirmed and transmitted remotely or offline to the embedded device. On the device itself, the license code is verified with the help of CycurLIB. 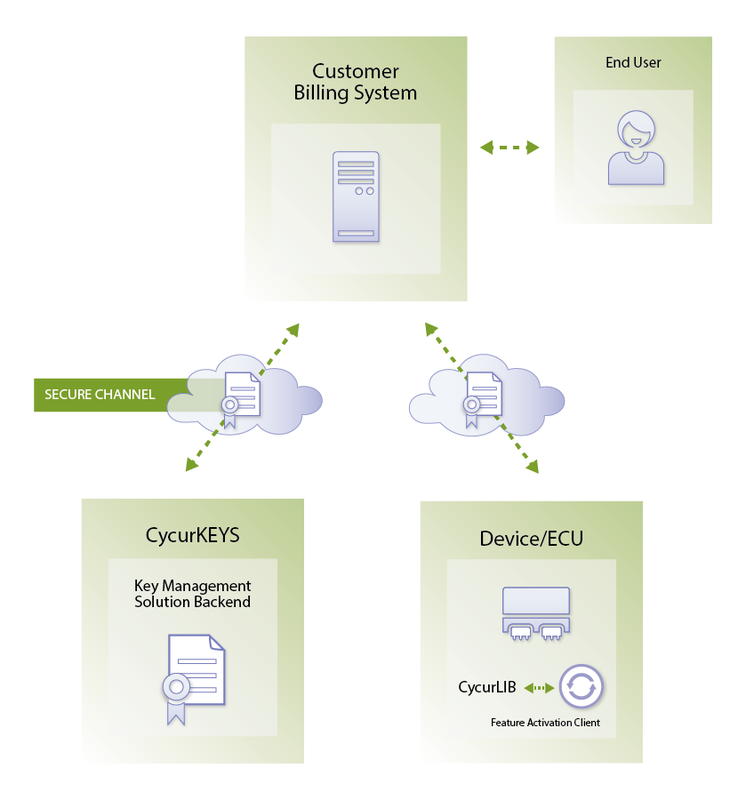 Our CycurKEYS product is a security software solution that creates and manages cryptographic keys, symmetrically and asymmetrically (PKI). Our activation tool supports management of the customer’s activation rights. CycurLIB provides the cryptographic algorithms needed to ensure the authenticity of activation codes.